Control from afar The Etekcity Voltson WiFi Electrical Outlet empowers you to remotely control your appliances, whether directly with your VeSync app (on your smartphone/tablet), or with Alexa voice control set up at home. Use it at home, from the office, or even from a cafe with Wi-Fi. Even create custom schedules so you can ditch double-checking your appliances all the time! Make your home smart at saving energy and costs Smart management actually helps eliminate excess consumption of electricity, since household devices can still eat up energy, even when not in use. This outlet also monitors a device's power usage via the VeSync app, so you know how much power each device uses. Save on your bill, and save valuable energy. Streamline home security Moreover, for the extended days you're away, replace old-fashioned timers that are limited in function. 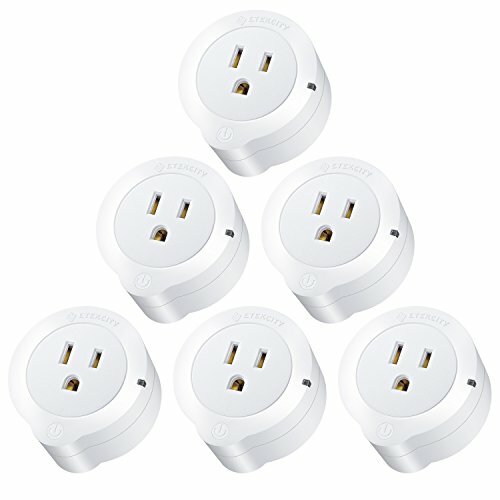 This smart outlet can turn on lamps on a set schedule, or at a moment's notice as you're miles away. 2.Timer Function: Can set over 30 groups of time for your appliances including schedule, action timer and countdown timer; 3.Triggered Actions: You can set a program that it will automatically switch off the outlet if power of device reaches programmed number; 4.Share Function: You can share your outlets with other family account so that your family can control it at the same time.